Perfect for your take-out restaurant, cookout, party, gathering, or other catering event, this Visions white heavy weight plastic fork will exceed your serving needs! Complete your plastic cutlery setting, or use it to fill your flatware bins at your snack shack or concession stand. Made of durable polystyrene, this virtually shatterproof, disposable fork is strong enough to last through your meal service, and can be easily disposed of, making cleanup a breeze. These forks are an excellent value! They are MUCh sturdier than the ones I was using from my old supplier, and basically the same price. Great buy! All around, these forks are great! We love having a sturdy white fork that won't break for customers; they are definitely not a "cheap" fork. We like the weight of these forks, the quantity and the price is very good too. We don't have a lot of events where we have to use them, but we like to keep them on hand for when we do need them. After spending so much at the box stores for plastic forks I am super excited to have found this website to order in bulk for a better price and quality than what you get at a big box type store. I have a small business and for the 25 or so employees who use these for lunch on a daily basis they were more than satisfied with this particular product. The forks are pretty durable and do not break easily. Will definitely buy again. Great quality fork. Sturdy and nice color. The white coloration is very bright. Fork does not bend or break easily and won't break if it's dropped. This is a very heavyweight plastic fork. The design on the handle makes it look even nicer. The quality is great and I wouldn't hesitate to use it with heavier meals like meats. Love this product, perfect for what we were looking for. Will purchase from this website again when in need of supplies for our business use.. I have a lot of parties through out the year for my family, which requires me to be Instock of disposables all the time. These forks are very good quality and for a good price . Forks are heavy duty and nice to have around in a pinch.We have the napkin packs as well.about the same quality as your club without purchasing a box.Would buy again. We love these. They are fabulously heavy duty. Great for salads or anything really... they do not break, even if you are stabbing your food. And they visually look nice. They do not look cheap. Absolutely great quality! They are not flimsy or break while using them. They are very sturdy and can be used for anything from fruit to food and even desert! We use these heavy weight plastic forks in our meals to go program. They are sturdy for all types of food and are a nice size. These white heavy weight plastic utensils are great for any restaurant or café with take out. Very sturdy construction, these will hold up to the toughest foods. We have rated these 4 of 5 stars because they cannot be recycled. However, if you are looking for a low cost, disposable fork option these are a very good value. We recommend these for food trucks and other places where to go food is the majority of the business. Visions also makes heavy weight knives and spoons to match. The Visions plastic forks are heavy duty for being disposable. They are very nice to have for home use, parties or other events. I am very happy with my purchase again highly recommend this product. These forks are very nice. They are larger and less expensive than what we can get at other stores. Very pleased. And shipping was timely! Thank you! This Visions white heavy weight plastic fork is great. This is heavy duty fork so it will not break easily. We liked this fork so much we bought 1000 pieces to constantly have them on hand. This is a bright white, heavy duty, sturdy plastic fork made by Visions. These are very inexpensive, pick up and hold food well, and are disposable for quick and easy clean up. These white heavy weight plastic forks are no doubt heavy weight. They are great. There is no need to worry about the tines bending out when you try to put your fork through some tough food. These are the perfect weight - lightweight yet not flimsy. They make a great impression with customers and are perfect for my cakes. Love them! A great price on takeout plastic forks! they are good quality, and even with shipping come out to be cheaper than other brands I've used. These are great heavyweight plastic forks. They have nice smooth edges but the tips are sharp enough to easily pierce food. excellent quality for such an affordable price! Used these for cake at a birthday party. They were perfect for cake & i have also used them personally for many other foods! i 100% recommend and will purchase again in the future for parties and home use! We use these forks for all of our disposable events. They do not break easily and the white is nicer when matching with napkins and plates. Excellent! As a family that often eats at home it's great to have these heavyweight plastic forks for our "heavier" meals and still save on clean up. The perfect fork for our church. Tough enough to stand up to anything, virtually indestructible, and yet economical enough to use for everything. No more stocking heavy duty forks for meats and light weight forks for cake and coffee. Really fantastic heavy weight fork that I use daily for work lunches. Get a bag if 100 for one super low price. What are you waiting for! I absolutely love this product! This white heavy weight plastic forks are strong and not flimsy at all! These forks were a hit for huge event with children. WE ABSOLUTELY LOVE THESE FORKS.. very sturdy and functional. This fork is a true disposable DINNER FORK. This fork will be added to our reorder list. The Visions Heavy Weight line of flatware are all great products. I really like the option of ordering these in different colors. They are sturdy and do not feel flimsy or cheap in any way. Very well made and heavy, The only plastic silverware I will use for any occasion, and won't break like other plastic forks you can buy. these forks are really nice. they definitely are heavy weight and very durable. nice little texture on the front of them as well. great price for a lot of good forks. Very good quality. We have used these for a while now at church for events and personal use and I don't think I have ever seen one break. I mean I'm sure if it was something really hard they might but we have never had an issue. I purchased these for use at social events at my church. They work well. Heavy duty. Bulk Quantity. Affordable. They "get the job done" with out complaints!!! 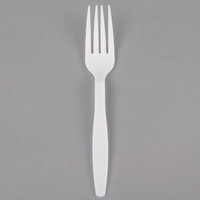 These are the basic fork we use for off premise catering. They are thick and hold up well to dense foods. Far superior to similar priced disposables available from our distributors. Excellent Durability. A must have for every business! It goes really quick so this case of 1,000 is just perfect! The price is really worth it! These are very sturdy forks for the price. You are able to use them to eat from hot noodles to hard cold ice cream cake. Definitely recommend! I ordered these and was very happy with my purchase. They are heavy weight and work great. I tried the medium weight to start and they bent way too easily so these were a great alternative still at a great price. Great heavy duty forks. I use them for lots of things. From eating dinner to eating desserts. They are strong and I must have for any party. I started with a small order to inspect the quality. The fork was a nice quality and will hold up for our church functions. We are looking forward to purchasing in larger quantity and saving money. The forks are of a very good quality considering the price. They feels very stiff and will not break while in use. They are a little difficult to store and the plastic back that comes inside the box will break easily. We hand these forks out to our customers to use with our salads. They are probably one of the best plastic forks we found for such a price, but we still get a few customers that occasionally have a fork break on them. For this price they are good. I am very picky when it comes to plastic ware. These forks hold up to my standards! I don't think I or anyone who has used one has broken one! These are some great basic plastic forks to use for to-go orders or parties. They are pretty sturdy for being disposable and the white color matches just about any decor. Highly recommend these plastic forks. They hold up very well and we have already had customers comment that they appreciate forks that do not break! Used the Visions White Heavy Weight Plastic Fork to eat watermelon. The fork easily was able to pick up, and or stab the watermelon with no problem. These are great forks-- we had ordered from another supplier and they were small and broke often. These are nice and sturdy, perfect for a slice of pie! First time ordering paper goods, great pricing and good product. Webstaurant is now my go to place for supplies. Easy ordering, fast delivery. Thank you. These heavy duty plastic forks are good quality. The times won't break off in your food, like with some cheap utensils I have used before. I would definitely repurchase these! Thank goodness I ordered 200 because the catering service forgot the utensils. Great for the Italian meal and the birthday cake!! Sturdy, good deal for sure. The Visions heavy duty fork is heavy duty enough for most meals. I am a limited service cafe so plastic utensils is all I use. Amazing Quality!! Convenient packaging. Strong and durable. Great and our customers love them! They are strong and present well. I would recommend them to any company wanting a strong disposable option for carry out or picnics or carry ins. These are PERFECT. Very sturdy/heavy duty. The packaging could be a little better-the bag tore open during shipping and I had forks all over the inside of the box. Cost way less than my local distributor! These are some of the best plastic forks I've purchased. Heavy weight is definitely better than light or medium weight. This is a good amount for the price. Visions Heavy Weight utensils are just that, heavy weight and perfect. Your utensils are not flimsy and you never have your utensils breaking while you are trying to eat. High Quality and for a great price! The Vision brand is great quality, as good or better than the leading brands and of course much more competetively priced from the WebStaurant store. Purchased these for a wedding reception along with the Vision Heavy Weight White Plastic Spoon and knives. We used them as dinner forks and cake forks. The price is great for the quantity. I still have some in my house for daily use. Excellent quality! Definitely heavy weight and a more high end disposable fork. I personally can't stand flimsy forks that can't pick up food, so I wouldn't want that for my customers. Great for any catering event or just as a to go item. These are excellent quality forks. We cheaped out for a while and went with some less-expensive ones (though not by much), but customers noticed. Back to these. Good value! These plastic forks are exactly what you would hope for in plastic utensils. We have had good luck with them. They do not break easily. Stronger than the ones i used to get from the local store. Really good quality! !Everything is sooo affordable! !Shipping was super fast!! Webstaurant will be my goto site for all my party needs!! These are great forks. We give them to customers for their pie. These are sturdy enough to slice through crusts and heavy pies. I've never seen one break. The handle is also much sturdier than the lightweight forks. This is a perfect fork for our break room. They quality is great. I would recommend to others and will be purchasing again and again. I spend allot of time traveling and there in nothing worse than a hotel room with no silverware . So now I purchase my silverware they are sturdy and a great price. The quality of these forks was very good. they held up well and are a good value for the money. They were strong enough to do the job well and we would buy these again. The forks were a nice heavy weight and very sturdy. We used them daily on a week-long vacation and they help up well; I would buy them again. As a cupcakery, forks are used very often here and we go through lots. These forks work perfectly fine, and we haven't had any complaints about them breaking too easily.